The Drakes are rather different to your usual neighbours. They are vampires and some of the members of the family date back to the twelfth century. One of the children, Solange, is the only born female vampire known and, as such, she poses a direct threat to the vampire queen. Her best friend Lucy is human, and when Solange is kidnapped Lucy and Solange's brother, Nicholas, set out to save her. Lucy soon discovers that she would like to be more than just friends with Nicholas. But how does one go about dating a vampire? Meanwhile, Solange finds an unlikely ally in Kieran, a vampire slayer on the hunt for his father's killer. I got My Love Lies Bleeding as a gift (along with the rest of the Drake Chronicles) from a friend and I'm so thanking him right now! 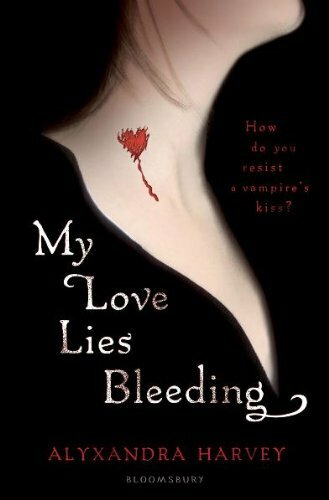 After Vampire Academy, I hadn't come across any other Vampire novel that I liked, at least,not until My Love Lies Bleeding. You have to excuse me for the comparisons between VA and this one. I can't help it. The story follows two best friends, Lucky (aka Lucy) & Solange. The book alternates between both of their POV's. Lucy & Solange's relationship/friendship is pretty alike to Rose & Lissa's,the only difference being Lucy's human and they don't share a 'bond'. This book has the cool bits picked from various other vampire novels like VA,House of Night,Twilight etc. and mixed them all into one! Solange is the only female vampire born and not made, in over hundreds of years. This makes her pretty special, as every male vampire now wants to wed and bed her so they can make a bunch of powerful baby vamps! Unfortunately, this also makes Solange unsafe anywhere outside her house, as any one of the afore mentioned male vampires could easily kidnap her. If that's not enough to worry about, Solange is also nearing her sixteenth birthday, which is when she will complete her transformation into a full-fledged vampire and a lot of vampires don't survive this transformation. Solange's family's huge with over 6 brothers, uncles, aunts,cousins etc. One of these brothers, Nicholas, and Lucy have never gotten along as kids but start finding themselves attracted to each other as the story grows. Oh Nicholas is in no way as hot as Dimitri but I did find the frequent banters between Lucy & him pretty amusing. If you're looking for something to fill a tiny void left by the vampire world, then go for this! It's enjoyable, fun and would surely make you want to read the next book!